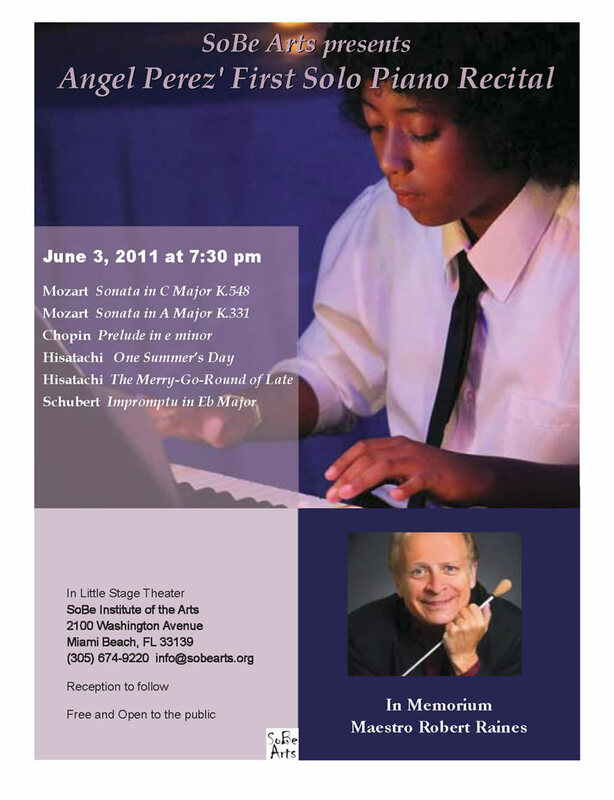 Friday, June 3rd, 7:30 p.m.
Angel Perez, a 12 year old piano student at SoBe Arts, will perform his first solo recital on the beautiful Steinway Concert Grand Piano that has been on loan to the Institute from the Miami Steinway Piano Gallery in Coral Gables. Angel, who has been taking lessons provided by a donation-enabled scholarship at the institute for only 3 years, opened the Brampton (Canada) Symphony Orchestra’s 2010-11 concert season last October, performing a Mozart Piano Concerto. He won international acclaim as the proud mayors of Brampton and its sister city of Miami Beach watched.